The National Football League season is just a few weeks underway, and many fans are preparing for a hopeful season, while others might not get their wish. The fall season brings a lot of excitement for football around bars, homes and restaurants all tuning in to catch the big game. However, when the other team scores that important touchdown or your team's kicker misses that easy field goal, what do you do? For some fans, stress and anger plays a role in watching a big game, which leads to numerous broken smartphones, laptops and iPads each year. Whether it's simply jumping up and down in excitement at a bar and dropping your phone in your pint of beer or throwing your device in anger, electronics tend to take the brunt of violence during sports matches. While this might seem simple, several Americans play fantasy football, which makes them want up-to-date information on how other players are doing in other games. This causes many people to have laptops and smartphones out the entire time while watching their teams play. If you get easily excited at all, put your devices away. If a surprise play or heartbreaking defeat happens, there's no device to break, drop, throw or spill liquid on. When people watch sports games alone, stress can cause them to react irrationally while no one is looking. 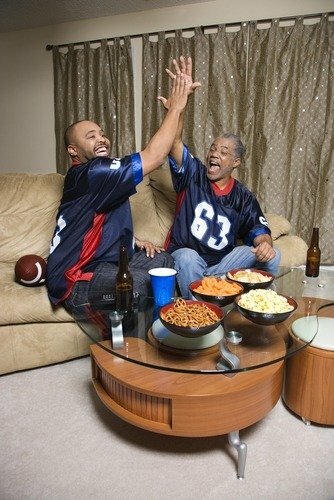 According to Science Daily, fans should watch the game with people they like to be around so their stress levels will not get so high. Additionally, watching the game with friends will help keep smartphones in pockets while hanging out on the couch or in a restaurant while watching the game. This might be the toughest pill for intense sports fans to swallow, but accepting the fact of a loss will prevent any irrational movements or actions that could break a device. Dr. William Wiener, a sports psychologist, explained that accepting defeat is a quick way to derail anger and stress, Men's Fitness magazine reported. "You have to accept that there will be injustice and realize that losing your cool doesn't do any good at all," said Wiener. Watching the big game at bar or restaurant can be a lot of fun for friends to get together. However, excitement can cause people throw their arms in the air, celebrate, cheer and dance. Keeping a smartphone in your pocket or purse will help you avoid any chance of dropping it from your hand in celebration, knocking it off a bar table or getting water damage from a drink spilling on it. While there are many steps people can take to protect their devices, personal insurance could help replace a phone that is broken or lost in the midst of a game day celebration.